Scroll page to view detailed slide images. Below is a discussion of a DNA sequenced single cell parasite which has nothing similar in the infection kingdom. The CDC confirms it is not Babesia or malaria, and had no idea what type of single celled parasite is present. I do not recall what percent was sequenced, but was very impressed by the explanation of Dr. Ellis at Fry Labs by his smart and educational summary. Simply, they did enough to be sure it was a new protozoa at the time of the call. As a short background, around 2005, I met microbiologist, inventor, laboratory director and family physician, Steve Fry. MS, MD. He showed me stunning protozoa and bacteria on the edge of red blood cells (RBC) using his new stain. 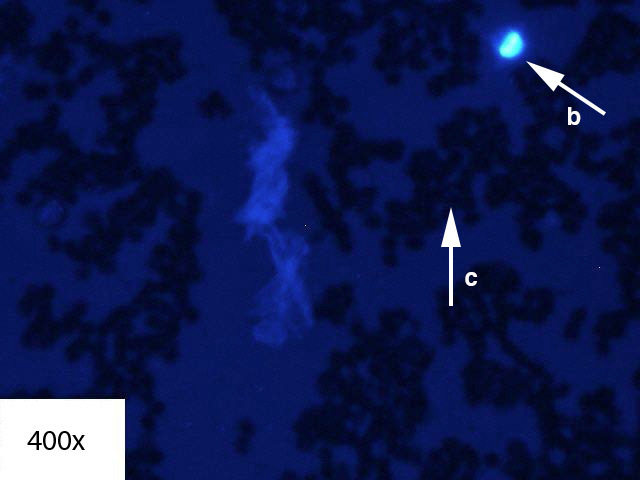 It clearly enhanced common smears to show more infectious life. A number of infections were easier to see by Dr. Fry's new staining technique. I confirmed his findings with other labs and with our emerging indirect testing by diverse laboratory testing, new highly specific tick infection physical examination and single organism class or species provocation testing. When we were sure Babesia and Bartonella were present-he was showing the same slide result about 98% of the time. Around March/2007 he moved to using this stain to focus fully on Bartonella or to similar appearing infections on the edge of red blood cells, and moved his lab goals away from slide Babesia diagnosis. Therefore, the last Babesia slide positive we were sent was March/2007, and we support whatever goals and methods he prefers. He has sacrificed profoundly for his lab, and he has my full support. It should be said that while more than one infection can be on the edge or inner edge of red blood cells than just Bartonella, and my Hematology Textbook shows it at various locations, our vast indirect testing based on two years of full-time Bartonella research reading, etc. has helped confirm most of these are Bartonella. It should be also noted that Bartonella is likely one of the most common infections on earth. It is certainly true it is carried in vast numbers of home pets and it is carried by more vectors than any other world infection. 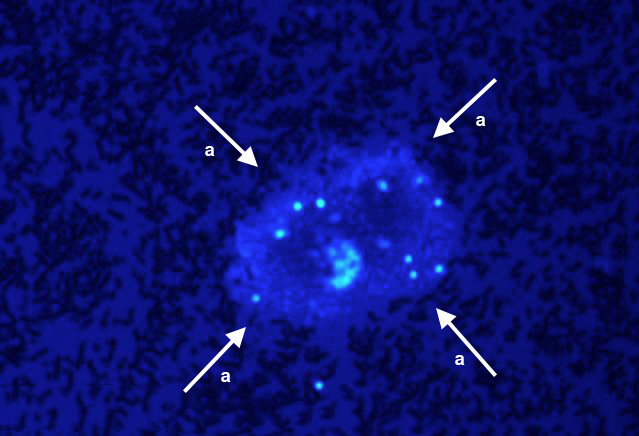 Moving back to the new protozoa, FL1953, Steve Fry had already seen it on his stains around 2005, but it looked like a simple Babesia ring form--like a dime inside a quarter (See the final image in this article). When the ring showed high whitening of the center, it was this new new single-celled parasite--FL1953. So my impression is that this new organism has been investigated since roughly 2007. Simply, my opinion is it is entirely new to the infection community, common and likely very dangerous. Some believe that some Lyme or Babesia treatments fail or patients die suddenly. It might also be due to clots or other damage from this super biofilm maker. Further, some infection physicians or others doubt it because of the lack of studies. However, due to the 3,000 year history of science and physicians to reject new information, current research studies will be published as close as possible in time according to Steve Fry's public talks. From 2005 until now, our full-time self-funded research center tried to remove Babesia, FL1953 (Protomyxzoa rheumatica) and Bartonella. In March 2007, Dr. Fry stopped using direct, published patented smears for FL1953 and Babesia due to a greater need for more sensitive testing. We have replaced that tool with high numbers of indirect advanced diagnostic tools and the use of private pathologists who will examine blood smear slides literally for hours for us. 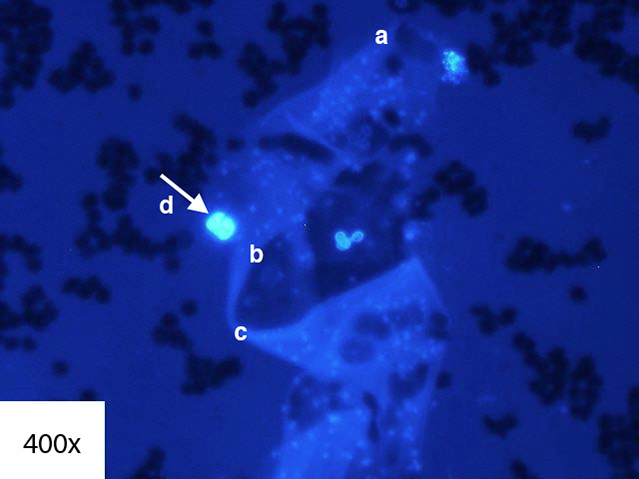 What is FL1953 or Protomyxzoa Discovered in Recent Years? Years ago, Steve Fry felt he was looking at a possible unique single celled protozoan. It was unusual as a super biofilm maker. 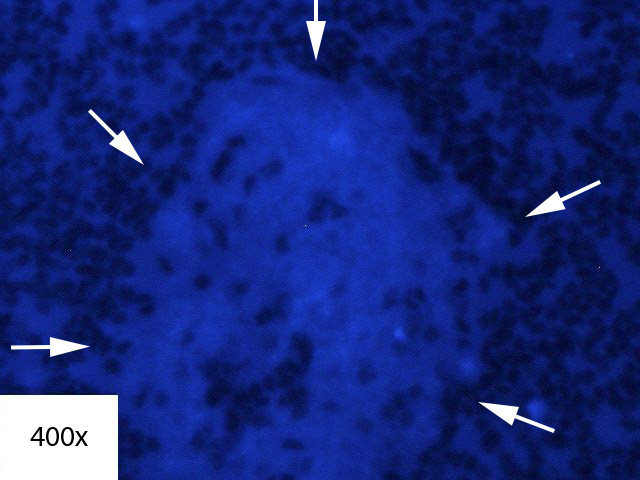 The CDC helped Dr. Fry by confirming his impressions and reported: the sample sent is not Babesia or malaria but a protozoa of unknown type. So Dr. Fry invested profound income into his lab, and in recent years has DNA sequenced and proven FL1953 or Protomyxzoa is a fully new protozoan. Equally as important is that scientists using Fry labs have come to realize this is a very common protozoan and due to the massive biofilm it can be hard to kill, and it can harm humans effectively. 6 Years ago I was surprised no book existed that showed all the various microscopic appearances Babesia can present. So in 2008 I published A Laboratory Guide to Human Babesia Hematology Forms. Why mention this point? When you look at the FISH tests (IGeneX laboratory) which are in black and white, they only show Babesia microti and Babesia duncani. The book mentioned above showed over 100 forms of Babesia. FL1953 might have fewer patterns. In addition, FL1953 resides in a massive biofilm. When you talk to a real scientist about PCR testing it is like discussing a great love or superior life experience. However, my concern is some feel the testing for tick, flea and other insect vector infections is the same as DNA testing from the television show “CSI.” You get a disposable cup from the criminal and you have the DNA from the infinitesimally tiny residue in lip marks. This is not the case in reality. My conversations with other researchers and other clinicians, and my patients’ intake information and follow up calls to them show that most PCR results report a false negative with tick and flea borne infections. Therefore, while I suspect the PCR test for FL1953 is “good,” I do not have an opinion on the percentage of patients positive for FL1953 who would be detected. I must be frank about my bias. Unless you are able to cause infection debris to be very high before the test, I feel it is not worth the money unless you are affluent. PCR is likely a very good test, as long as you do not conclude that a negative result means your obviously positive smear is worthless. Just as Babesia and Bartonella have many species, might not there be another cousin of FL1953 that is also a super biofilm maker? So my opinion is that it would be unwise to reject an enriched-stain blood smear that shows positive for FL1953 Protomyxzoa. What is Important in The Stains Below? a: A white blood cell that fights infections and which is larger than the smaller red blood cells . 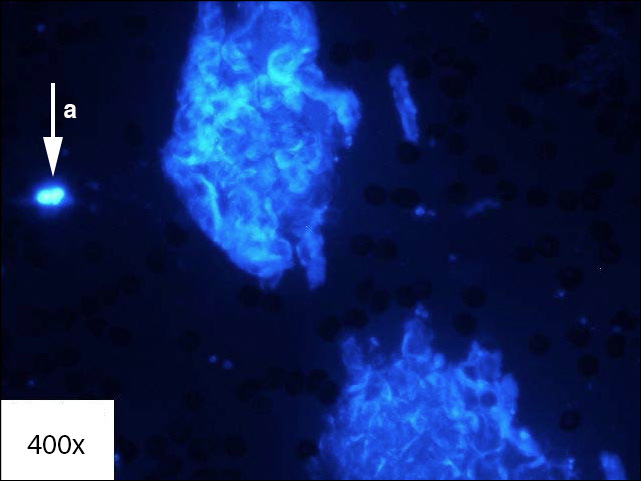 DETECTED (FEW) - Few biofilm community-like structures and/or organisms were observed using a fluorescent DNA staining technology or Giemsa using enrichment via centrifugation. 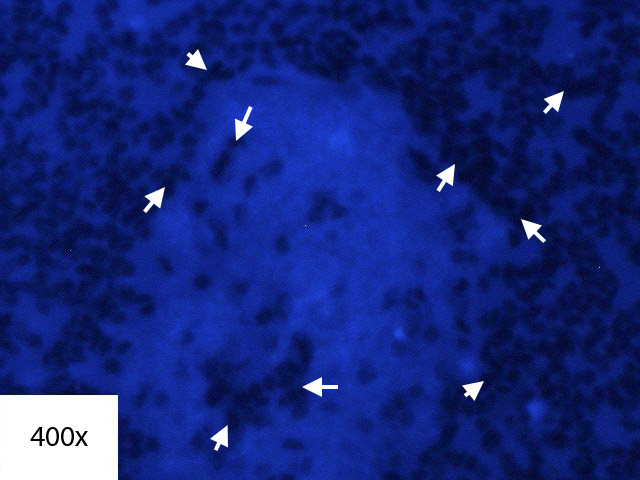 These findings are suggestive of an unspecified infectious and/or parasitic disease. The magnification is listed on the image above. b: The black ovals or circles are red blood cells. These are 6-8 microns in size. These cells help to anchor you to get a general sense of the size of other things. 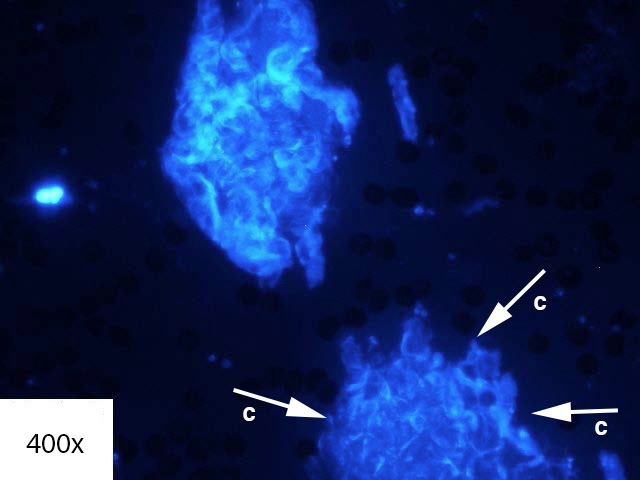 The larger white cells are actually vivid white in this preparation in the images. In other stain preparations they are not obviously white. The white cell is 8-18 microns or about 12 microns on average, which is much larger then the plentiful red cells (RBC). c: The size of this blob is massive when compared to cells of known size. I would think it is at least 100x larger than a red blood cell. Note the profound complexity of the thread-like parts with twisting and U directional movement, and some dive down into the large biofilm. Amazingly this has DNA, protein, complex sugars and even lipids or fat! And it seems everything but household pets get caught up in this material, which prevents death of microbes within it from exposure to synthetic or natural antibiotic agents. 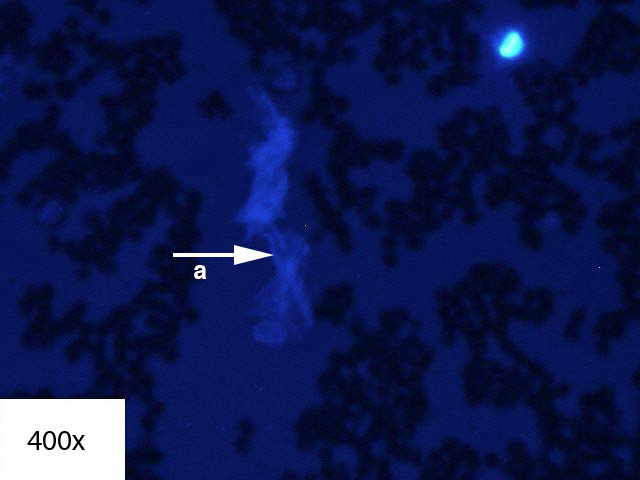 DETECTED (FEW) - Few biofilm community-like structures and/or organisms were observed using a fluorescent DNA staining technology or Giemsa using enrichment via centrifugation. a: This up and down twisting shape is a biofilm made by FL1953. It may be broken off of a larger one, or one made by FL1953. One concern is that clinicians who do not study full-time, but see patients full-time, have no time to find new medical information themselves. If 1/1000 physicians knew about this infection, I would be very surprised. So 99.9% of smart physicians have no idea this exists, do not realize the CDC said it was not malaria or Babesia, but an unknown protozoan. They also do not know it has been DNA sequenced and proven a very unique protozoan that makes massive biofilm material. So let’s imagine someone has a biofilm related infection, since most bacteria are in colonies, not floating as orphans. Can you imagine the failure of treatment if their infection or infections lived within this blob? Or this blob maker was one of their infections with a couple others. b: A white blood cell is supposed to kill infections. What chance does the WBC “b” have against this huge single-celled parasite slime maker shown in the many images in this collection? 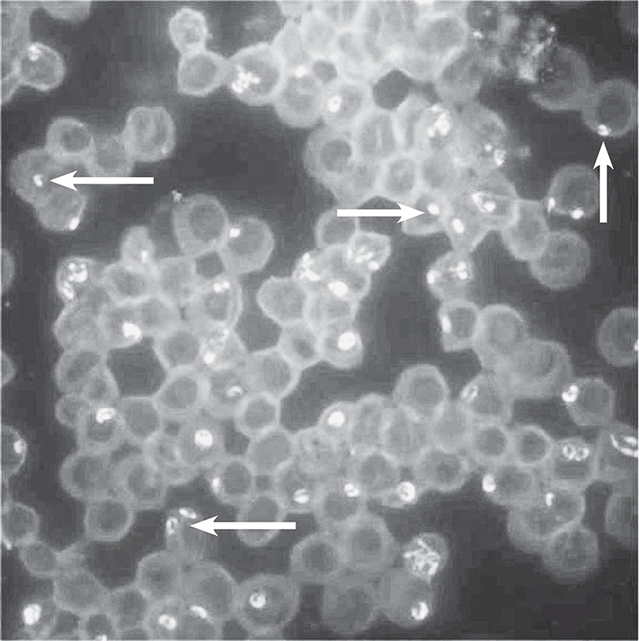 c: The small black clusters of circles are red blood cells. DETECTED (FEW) - Few biofilm community-like structures and/or organisms. 1: Please note the very dense red blood cells that are fairly large in number. 2: Look at the open center of the slide. That is not space without substance or only blood fluid. It is a massive biofilm, perhaps 500x the size of a red blood cell. DETECTED (FEW) - Few biofilm community-like structures and/or organisms were observed. Please note the density of this biofilm ranges from a lace pattern (1) to profoundly dense organic matter (2) and (3). 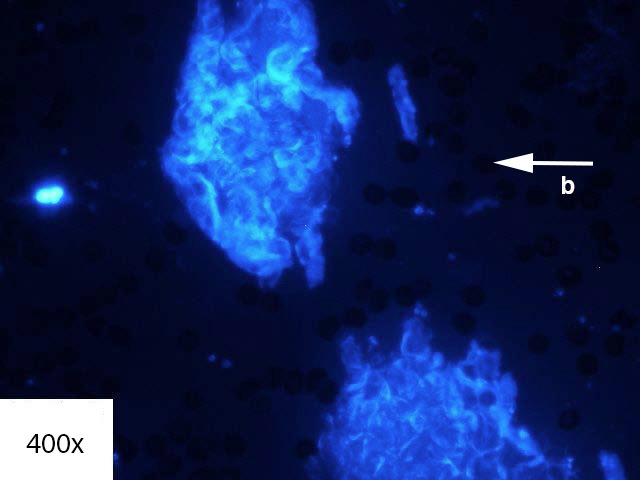 This type of image shown in (2) and (3) makes it obvious that any treatment for this biofilm’s dense parts or any type of thick/complex biofilm needs to be handled with an agent or agents with profound abilities to penetrate this complexity. 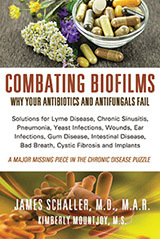 Most current treatments in alternative, functional and traditional medicine do not have the ability of defeating this complex thick film. We feel we have solution that work. DETECTED (SUBSTANTIAL) - A substantial level of biofilm community-like structures and/or organisms were observed. a: This large biofilm mass is so large that the blood sample is only mildly magnified. (This is clear because the RBCs are very tiny). Your blood vessels are roughly 100 miles long. Even a child has over 50 miles of blood vessels. And the only way you stay alive is that your cells are fed by oxygen and glucose, carried through miles of these tiny capillaries, which are so thin that red blood cells can only pass through in single file. Can you imagine this biofilm with its apparent immense complexity entering modest sized blood vessels that feed the brain, heart, kidneys, liver, face, hands and feet? 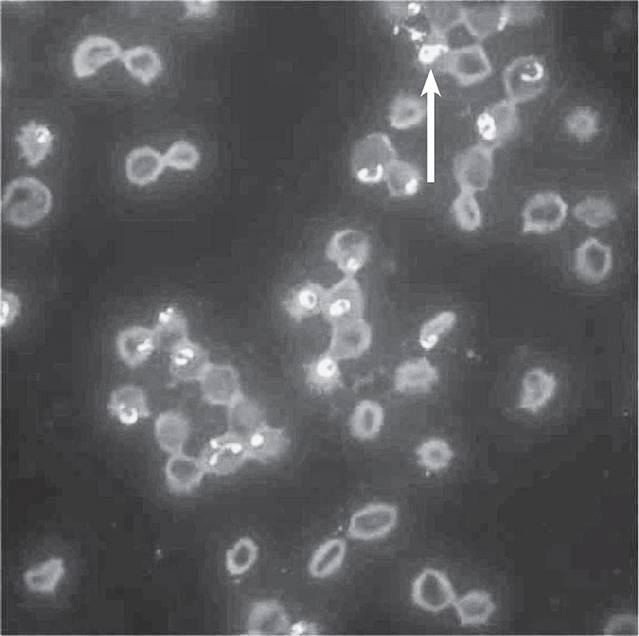 Note arrows indicating white blood cells (WBC). FL1953d slime is vastly complex with a wide range of parts, and which could also hide safely a range of other infections. In reading the routine proposals in traditional and alternative medicine for biofilm treatment, it is limited. Simply, I am doing a biofilms solution book because we need a better one with solutions only. Biofilm infections are not rare. They are the norm. Nevertheless, smart people are offering very limited treatment options. Some offer an enzyme that only undermines proteins, but FL1953 also has complex sugars and even fat. It also assumes many enzymes will act as a key to destroy the protein components of FL1953, Lyme’s complex biofilm, and the biofilms of hundreds of diseases. Traditional physicians also are trying sincerely, but when they offer options such as stronger and different synthetic drugs or silver coated catheters, they miss the obvious. Traditional physicians know that these drugs will eventually no longer be able to deter biofilms, since they think about resistance in highly infected hospitals where antibiotics flow like a powerful river into the sickest people in society. and Babesia Duncani. No Probe is here for FL1953. What is curious here? 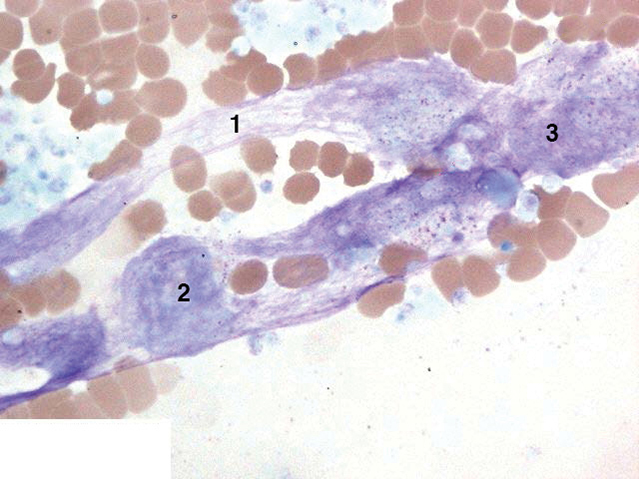 Perhaps the vast number of shapes in these Babesia forms. This second sample from IGeneX lab shows profound diversity of two very specific species of Babesia. The CDC and other Departments of Health gave me many free images, but none are as diverse as this masterpiece in soberness. This lab has been virtually perfect on Lyme Western Blots in 5 positive and negative samples every 4 months for ten years. Further, like FL1953 Lyme that is not quickly treated after first bite often has a very complex biofilm according to Professor Eva Sapi, PhD. The source of FL1953 is possibly ticks, fleas, mosquitos, other biting insects, pets, blood, or an infected birth mother, which is never mere Lyme disease, if one is sober and educated in 2013. My suggestion is some who are physicians excessively certain of Lyme’s removal in four weeks, to consider an injection with Lyme [Bb]. And if they are negative by their diagnostic approach they do not get treated. How many magical about cure in four weeks would risk it. Based on a devastating study by Florida research scientist and tick expert, K.Clark? Ph.D., very clear and ill patients were found to be fully positive for Lyme disease using advanced DNA testing published in July 2013. However, 90% were missed using the routine simplistic approach in USA and many other countries. 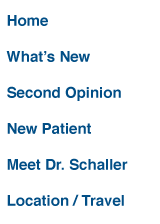 These suffering people were tested by the ELISA followed by a simplified WESTERN BLOT KIT, which is called the “two-tiered” approach. So for 90% this approach is a disaster, especially for those ill for over a year—one was ill 27 years. By the way, this researcher does not have the massive conflicts of interest discussed in detail in the law and medical article “Cure Unknown.” [The Clark article is found in the Int. J. Med. Sci. 2013, Vol. 10]. 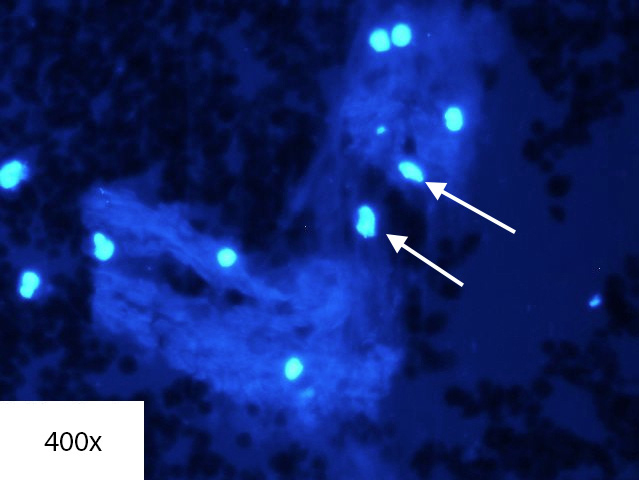 I would like to suggest that the non-targeted stain used in early years by Fry labs often detected FL1953 or Protomyxzoa, and that this protozoan tends to have more ring forms than Babesia. Of course this is only a proposal and not a certainly. 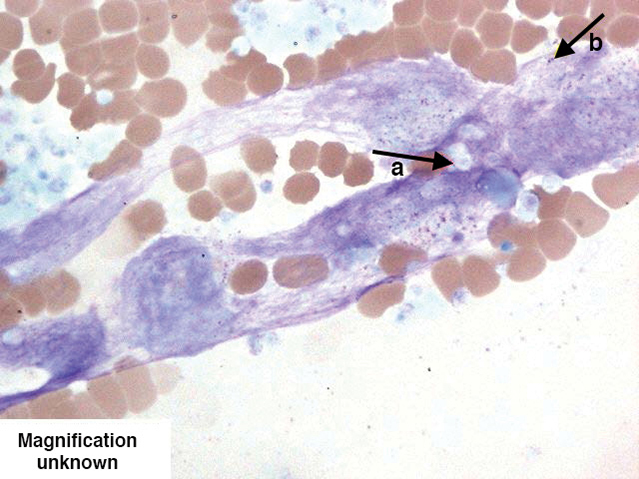 You can see proposed samples in my Hematology book of 2008, which has images going back to at least 2005. I have pulled “Babesia” looking rings from page 157, 160-162, 165-167 and 171 before Protomyxzoa rheumatica was identified. See book free at: https://www.personalconsult.com/free/books.html. See these possible FL1953 samples years before they were clearly identified as a new single celled parasite. Notice also the removal of color inside the ring consistent with the use of iron. a: This tiny round or oval infection is likely one of many possible Bartonella-like oval bacteria in this slide. b: A routine standard trophozoite protozoan or possibly FL1953 ring stage which is presented in this manner in over 20 source textbooks, journals or parasite slide collections on my website and Amazon.com. Please note that “2” and “3” in the left lower corner have very vivid rings and the center is white or becoming white. 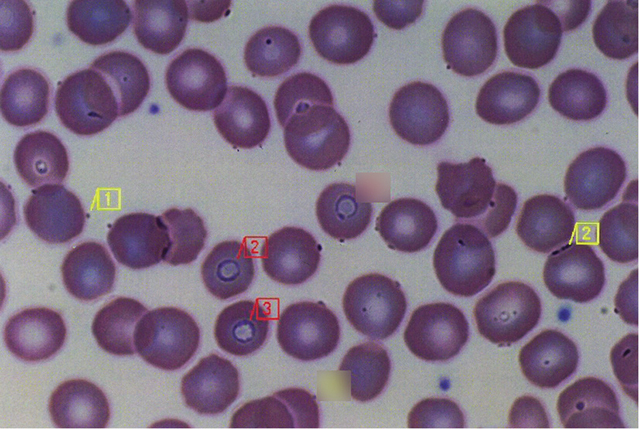 This is not Babesia, it is Protomyxzoa or FL1953. This means before or during 2005 we were actually looking at an infection I personally feel is possibly more dangerous than Babesia, and Babesia in humans kills, and 100 years ago killed most of the cattle in the southern USA. We believe we were killing FL1953 or Protomyxzoa almost ten years ago. In our inherited patients, for example, in our blind studies to test if the last healer was using a useful treatment we looked to see what really killed Babesia and Bartonella. We were able to see the presence and absence directly and indirectly of Babesia, FL1953 and Bartonella. Some things that supposedly work—do not work at high doses. Other things new to infection medicine do work. I was very sad when the gifted Fry Labs stopped showing Babesia on thier smears. The last slide I received from Fry Labs, who do very useful work, that showed Babesia was in March/2007. I assume it was due to harassment by ignorant local MD's who would not know Babesia if it landed on thier nose. So now I have to send my blood to top pathologists through a private arrangement to look for hours to see Babesia. The CDC says you only need to look for Babesia for 2-3 minutes. I think they are doing too much pot research. It can take four hours to find Babesia in blood smears. The material above is not meant to be flawless and the standard of care. They are merely preliminary materials to serve researchers.